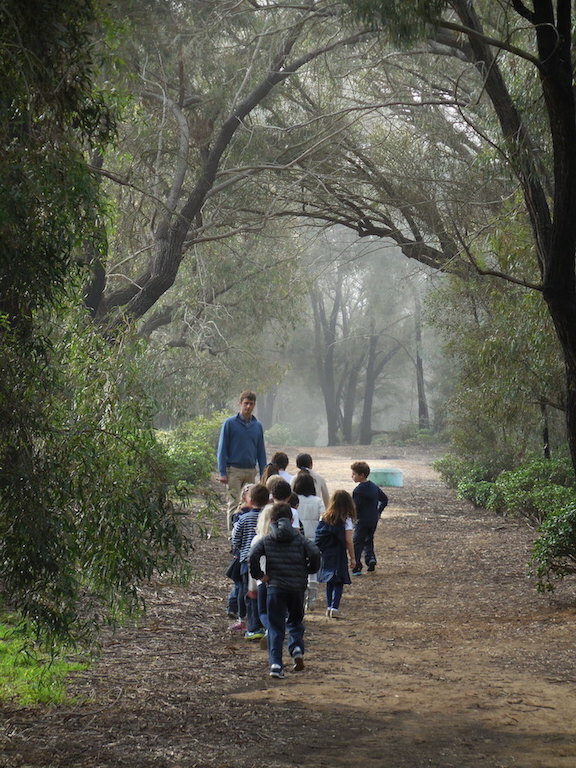 The Montessori elementary program covers first through sixth grade. The elementary curriculum branches out from five Great Stories told to all students at the beginning of the year. These tales introduce key concepts and encourage the children to ask questions that then lead to individual or (more commonly) group projects. The elementary curriculum is also known as “Cosmic Education” because the subjects are presented in ways that illustrate the interconnected nature of knowledge. During individual and group presentations, the teacher uses the Montessori materials to illustrate key concepts and then guides further exploration in each subject. Students regularly undertake research projects based on their interests and present their discoveries to the rest of the class. In addition to the work with the Montessori materials, the elementary program relies heavily on science experiments, storytelling, research in books, contact with experts in the broader community, field trips and community service. Music, art, dance, organic gardening, drama and culinary arts enrich the core Montessori curriculum and are available to all students as exploration in different projects. Our bilingual program allows the entire curriculum to be presented in both English and Spanish. The elementary program focuses on helping students develop character. Our open environments offer the children opportunities to ponder questions of morality, justice and empathy through their interactions, storytelling, group activities and community service. Teachers and students work jointly to keep track of projects and discuss strategies to ensure students are receiving in-depth exposure to all subjects. Parent-teacher conferences are held twice a year with the goal of sharing academic and social-emotional progress with parents. The Montessori elementary program is designed mainly for children who have had at least a partial Montessori background during the preschool years. To ensure proper functioning of the classroom, elementary students are expected to be able to choose activities without adult direction, work independently, finish a cycle of work, keep track of their projects, follow classroom rules, participate in classroom discussions, and respect other classmates. On occasion, a child who doesn’t have a Montessori background, but who demonstrates these abilities, will be accepted into the program.